This tutorial describes a way to design a semi-realistic home theatre room using only the basic tools of Photoshop. The aim of this tutorial is to aid the beginners of Photoshop in the designing process. A lot of basic tools are used in this tutorial and also some simple techniques to turn a simple concept to a beautiful design. Ok, open Photoshop; go to File Menu then ‘New’. Set the Width -800 px, Height-500 px. Change the name to ‘Home Theatre Room Design’. Click OK. In this step we are going to create a new gradient. This gradient gives the design a beautiful look. We are going to add this gradient to the wall and the floor at the same time. Ok let’s now start our gradient creation. OK. Select the Gradient Tool. If you are a keyboard lover you can activate it with the key ‘g’. Use ‘Shift+g’ to toggle between the Gradient tool and the Paint Bucket Tool. In this step we are going to create a new gradient. This gradient gives the design a beautiful look. We are going to add this gradient to the wall and the floor at the same time. Ok let’s now start our gradient creation. OK. Select the Gradient Tool. If you are a keyboard lover you can activate it with the key ‘g’. Use ‘Shift+g’ to toggle between the Gradient tool and the Paint Bucket Tool. Click on the Default Gradient in the Tool Options Bar to edit it. Now the Gradient Editor Window opens. Here we are going to edit the Default Gradient; by changing its colour and saving it for future purposes. Ok, this is the Black to White Gradient; now let’s change its Black Colour to another colour. First click on the Black Colour Stop indicated as 1. Its colour is displayed in the box indicated as 2. Click on the Colour to edit it. Now the Color Picker Window opens. Just change the RGB values to R-68, G-29,B-32 and press OK.
You will be returned to the previous screen. Now let’s change the Colour of the other colour Stop. Click on the White Colour Stop, and then Click on the White Colour Box to edit the colour. Now change the RGB values to R-195, G-156, B-157 and Click OK.
Now we get this Window. Change the Name to “Cool Gradient”, and then Click on ‘New’ and Finally Click on ‘OK’ to Save the Cool Gradient for future purposes. Ok. It’s done. In the next step we are going to design the Wall and apply this Cool Gradient. First we are going to draw a Rectangle Shape then add a gradient and noise to it to make it realistic. Let’s start with setting Foreground Colour to White. Press ‘D’ on the keyboard to reset the Foreground/Background Colour selector tool to its Default settings. Now Click on the Arrow with Two Heads to Switch FG Colours or BG Colours. Now the Foreground Colour is set to White. You can also use the Keyboard Shortcut ‘X’. Now select the Rectangular Shape Tool. On its Tool Options Bar select the option ‘Shape Layers ‘to activate it. Now draw a large Rectangle starting from Top Left towards the Bottom Right. BUT LEAVE SOME SPACE AT THE BOTTOM. In that space we are going to draw the floor later. So it is a good idea to leave space for the floor. Now we get a Shape layer. Double click on the layer to open the Layer Style Effects window. In the Layer Style window we activate the Gradient Overlay option by clicking it. Now Click on the Drop –down box of Gradient Sub-Option and Select the ‘Cool Gradient’ that we have created earlier. Now change the values as shown in the following image. Opacity-100, Reverse- Enabled, Align with layer- Enabled, Style- Radial, Angle -12(minus 12), and Scale- 96. Click OK.
Now we are going to add some Noise to this Beautiful Gradient for a realistic look. To add Noise to the layer we use the Noise option in the Filter Menu. But before that we should change the Shape Layer to a normal Layer. Ok now click on the Layer 0 and then add a New Blank Layer by clicking on the New Layer Icon. From the Menu select the Merge Down option. Now the Shape Layer is changed to a Normal Layer. Then we go to the Filter Menu and Click on the Noise then Add Noise..
You will be presented with the following image. Ok we are going to add an Outer Glow to the layer. It is to give a little texture to the space where the Wall and the Floor meet. Now Double Click on the Layer 1 to open its Layer Style window. Change the values as shown below. Change the Opacity-47 %, Size-2 px and finally Click on the Yellow Box which is the Colour of Glow. In the Colour Picker window Change the RGB values as R-144, G-105, B-107 and Click OK.
You will be returned to the previous screen there you can Click OK to apply the Changes we made. Another point is that you may not notice a big difference in the image, don’t worry they will start to glow in the next step. Ok in this step we are going to design the floor. Right Click on the layer ‘layer 1’ and select ‘Duplicate Layer’. In the Duplicate Layer box change the name into ’floor background’ and click OK.
OK now the ‘floor background’ layer is created. Then we move the ‘floor background’ layer below the ‘layer 1’ layer. Click and drag the layer as shown in the image. For better handling, it is a good practice to name every layer we create. So let’s change the name ‘layer 1’ to wall. Double click on the ‘Layer 1’ text to change its name. Another good practice in the design process is to move similar layers to a group. It avoids a lot of confusion and saves a lot of time. Also keep an eye on the name of the group. The name should be descriptive about the contents inside the group. We have created a Wall layer and Floor Background so far. Now let’s create a group and move the wall layer to the group. There are 2 ways to create a group and move layers into it. Let’s get familiar with the first way. The folder icon towards the bottom the layers (shown within red circle) window is the button to create new Groups. Click on the button to create a new group. Ok now ‘Group 1’ is created. Then Double Click on the ‘Group 1’ text to change its name. Change the name to ‘Wall Layers’. And move the ‘Wall ‘layer’ to the ‘Wall Layers’ group. Ok now let’s learn the second method. In fact it is the better and time saving method. In this method you select a layer and click on the Folder Icon with the SHIFT key pressed to create a new group. Photoshp will create a new Group and move the layer you have selected earlier to the group at the same time. Time saving!. Ok let’s practice it. Click on the wall layer, press SHIFT on the keyboard, and holding the SHIFT key Click on the Folder Icon to create a new group. OK if you get the correct result, change the name of the group to ‘Wall Layers’ as we have done in the previous step. Now click on the Floor Background layer then press Ctrl+ T on the keyboard or go to the menu Edit->Transform->Scale. The transform box appears around the layer. We are going to just move the layer towards the bottom of the image. Click on somewhere inside the Transform Box, the cursor changes its colour to Black, now just drag towards the bottom. You will get the following image…. Now we are going to draw a rectangle shape and fill it with some subtle tile texture in order to give the floor some perspective. You should draw the rectangle from outside the image area as shown in the following image. Later we can skew the rectangle to give the layer some perspective. 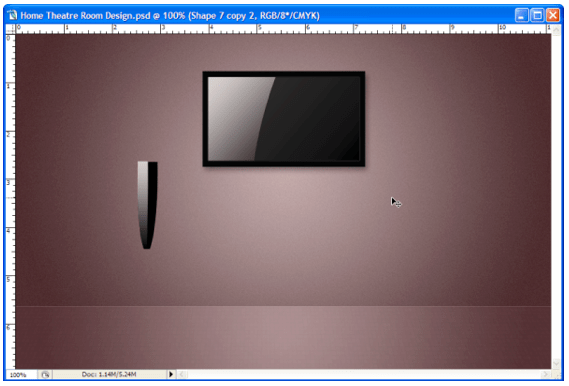 If the rectangle exceeds the boundaries of the image area it will be easier to skew the layer. Ok now we are going to add some texture to the floor. Go to the Filter menu then Patchwork. For applying this filter we should first rasterize the layer. Click ok to Rasterize the layer. Set the Square size to 1 and Relief to 0 and click ok.
Now the rectangle gets filled with the texture. For adding a Perspective to the rectangle we are going to skew the rectangle. Press Ctrl+T on the Keyboard or go to the menu Edit->Transform->Skew. A transform Box will appear around the rectangle with Control Points. We can skew the rectangle to any direction using any of these control points. Ok now click and drag the bottom left Control point of the transform box to move that part of the rectangle towards the left side. The bottom left control point is shown within a red circle to make it clear. Now click and drag the right bottom control point towards the right side. The control point is shown in red circle. Now it’s time to give the rectangle some layer effects in order to make it look realistic. For that double click on the Shape 1 layer. The layer style window opens. Click on the Gradient Overlay Option to activate it. Change the opacity to 77%. Select the Cool Gradient from the Gradient Drop Down box. The Reverse option should be enabled. Set the Style as Radial, angle to -10, Scale to 150% and also the Align with Layer Active. Click Ok to apply the setting to the rectangle. Now change the opacity of the shape 1 layer to 75%. As I have said earlier grouping similar layers is an important matter in the designing process. So let’s create a new Group. But before that you should Change the name of the Shape 1 layer to’ Floor tiles’. Just double click on the Shape 1 text to edit it. Type ‘Floor Tiles’ in that space. Ok now Select the Floor Tiles layer and the Floor Background layer together. Then press the Shift key on the keyboard and holding the Shift Click on the Folder icon to create a new Group. Now photoshop creates a new group and moves the 2 layers we have selected earlier to the group. Now rename the Group to Floor Layers. In the next step we are going to design the LCD TV. Press ‘D’ on the keyboard to change the foreground and background colour to the default. Double click on the newly formed shape 1 layer. Click on the Drop shadow option and change the settings as shown in the image. Now click on the Stroke option and change its values. Now we are going to add a glass like effect to the inner area of the lcd tv as in the real life. Press‘d’ in the keyboard to set the fg and bg colours to the default. Select the rectangle shape tool from the tool box and then set the style option to none by going to its options bar. Now draw the rectangle starting from inside of the border as shown in the following image. You will get this image…. Now double click on the shape 2 layer to open layer style window. Click on the ‘gradient overlay’ to activate it. Then change the settings as shown in the following image. Then click on the ‘Gradient’ drop down box and select the ‘foreground to background’ grandient. After selecting the gradient click on the gradient to edit the gradient. Click on the white colour box to change the colour.. In the colour picker window set the rgb values as r-58,g-55,b-55 and click ok..
Now click on the stroke option and change the setting as in the following image. Select the ‘Cool Gradient’ we have created earlier from the Gradient drop down box and change its angle too. You will come to this image. Change the foreground colour to R-124, G-86, B-88. Select the Rectangle Shape tool and draw another rectangle as shown in the following image. Now press ‘Ctrl+T’ in the keyboard to transform the shape. The transform box appears around the layer. Right click somewhere in the image, and select the option ‘Skew’ from the menu. And move the point towards the left a little. Now click on the ‘top right’ control point and move towards the right side a little bit. Do not move the control point too far. A little movement is enough. You will get a result as shown in the following image. Now double click on the Shape 3 layer. Click on the gradient overlay option and change the options as in the following image. Change the gradient to ‘White Black’. You will get this cool result…. Select all the shape layers and click on the folder icon to create a new group. Change the group name to ‘tv layers’. Ok it’s done. Now let us move to the last part of the design. In this part we design speakers and place them accordingly in order to enhance the perspective of the design. Select the rectangle shape tool and draw a rectangle like this…..
Press Ctrl+t on the keyboard to transform the layer. Right click within the transform box and from the Transform menu select the ‘Skew’ option. Now click on the bottom left control point and move towards the right direction then click on the bottom right control point and move towards the left. Your result will look something like this …. Ok now move the four control points towards the outside a little bit. You will get this result…. Now change the name of the shape layer to ‘Speaker right side’. Again select the ‘rectangle shape’ tool and draw another rectangle as shown in the following image. Press Ctrl+t and right click within the transform box and select the option ‘Skew’. Move the ‘bottom left’ control point only towards the right side. Again right click and select the option ‘warp’. Now double click on the layer in the layers palette. Then the layer style window pops out. Select the gradient over lay option and then go the gradient drop down box in the right pane of the window. Select the Black White gradient. Then the Black White gradient appears in the Gradient box. Just click on the gradient to edit it. You will get the following image. We are going to change the white colour into a subtle red tone. Click on the white colour box to change the colour. Now the colour picker window opens. Just change the RGB values into R-209, G-196, B-197 and click ok.
Ok lets change that layers name into ‘Speaker left side’. 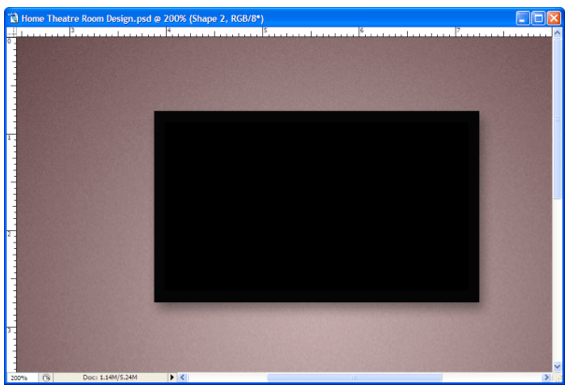 Draw another rectangle using the rectangle shape tool as shown in the image. Double click on the layer to open the layer style window and change the ‘inner shadow’ settings as shown below. Then click on the gradient overlay option, go the gradient dropdown box and click on the ‘arrow sign’ to view its more options. Here you can see the ‘metals’ option towards the bottom of the menu. Just click on it to add the metals gradient. Photoshop will ask to replace the current gradients. Just click on the append button. Now we have appended the metals gradient to our gradient box. Select the ‘steel bar’ gradient. Now the steel bar gradient will be displayed in the gradient box. Just click on the box to edit the metal gradient. You will be presented with the following image. Here we are going to change the location of the black colour stop. Click on the black colour Stop. Now enter the value 41 in the location input box. You can see that the black colour stop moves to the new position in real-time. Also set the location of the white stop to 75% and the right most black colour stop to 95%. Click ok to apply the changes. You will be presented with the previous screen. Change some other values as shown in the following image. Now in the layers palette, just change the name into ‘speaker bar’. Select the ‘ellipse shape’ tool from the tool box and draw an ellipse. Change its name into ‘Speaker base’ in the layers palette. Double click on the layer. In the layers style window select the gradient overlay option and change its values as shown in the following image. Just draw another ellipse using the ‘ellipse shape’ tool as shown in the image. Change its name into ‘base shadow’ in the layers palette. Now select the gradient option. Change the values as shown in the following image. Click on the gradient to edit it. Change the value of the first colour stop into rgb 0,0,0 respectively. For the second colour stop set the RGB values as R-61, G-52, B-52. (The detailed method to edit a gradient is explained in previous chapter s). After editing the gradient also set the following values. Ok now we are going to move the two layers to the base of the bar. But before that you should change the layer order of the layers in the layers palette. The ‘Base Shadow’ layer SHOULD BE below the ‘Speaker Base’ layer. Ok If you have changed the position correctly you can now move the layers together to the base of the bar as shown in the image…. Ok. For a realistic result we can make the base look reflective. Just right click on the layer ‘Speaker Bar’ and click on ‘Duplicate’. Change the name into Speaker bar mirror and click ok.
A new shape layer will be created. Press Ctrl+T to activate the Transform tool. The transform box appears around the image. Move the top middle control point towards the bottom side of the image. Now move the cursor to the inside area of the Transform box, the cursor changes to a black coloured one. Click and drag to move the image to the bottom a little bit. Now it is the time to add some subtle details to the speaker. Just double click on the layer ‘Speaker Left side’. The layer style window opens. Change the opacity of the gradient overlay to 78%. Click ok.
Now photoshop asks whether to rasterize the shape. Click ok to rasterize. Now go to the Filter Menu then Click on the Option ‘Noise’ then ‘Add Noise’. In the noise option window change the amount to 20%, select the ‘Uniform’ and ‘Monochromatic’. Click ok to apply the settings. In the layers palette rename the first ellipse as ‘Round 1’ second ellipse as ‘Round 2’ and the third ellipse as ‘Round 3’. Now double click on the ‘Round 1’ layer. In its layer style option window apply the following settings. First one is the ‘Inner Shadow’ setting. Stroke option…. Here too the gradient is set as ‘Black White’. Now Right Click on the ‘Round 2’ layer and click on the option ‘Paste Layer Style’. Repeat the same procedure for the Layer ‘Round 3’. You can see the result in the following image. Now it is the time to move all the Circles to the centre region of the speaker. Select all the ‘Round’ layers in the layers palette. You can use Shift key in the keyboard to select more than one layer. After selecting all the layers, press ‘v’ in the keyboard to activate the ‘move’ tool. Now move the ellipses to the centre of the speaker. Select the entire round and the speaker layers together. You can use the Shift key to select multiple layers. Now click on the folder icon to create a new group. Photoshop will create a new group and move all the selected layers to it. Now change the group name into ‘Speaker 1’. Then right click on the ‘Speaker 1’ group and select the ‘Duplicate Group’ option. In the duplicate group window leave the default name as speaker 1 copy and click ok.
Press ‘v’ in the keyboard to activate the ‘move’ tool. Then just drag towards the right side. The layers within the ‘speaker 1 copy’ group start to move to the right side. And the following image is the result. Right click on the ‘ layer 1 copy’ group and select the option ‘duplicate’. Now change the name to ‘Speaker 2’ and click ok. Using the move tool drag the image to the position shown in the following image. Ok now right click on the ‘Speaker 2’ group and click on ‘Duplicate’. Change the name to ‘speaker 2 copy’ and click ok.
Now using the move tool move the layer to the left side as shown in the following image. You can of course change the position of each speaker using the move tool. I have changed their position a little bit and over all it is good. That’s all folks!! Please remember that this tutorial is for beginners only with very little understanding of the basic tools in photoshop. Feel free to download the source files and don’t forget to share. Learn how to create design templates with testking 650-621 web design course. Get the free testking JN0-130 design tutorials and testking 642-164 live demos to become expert. This entry was posted on Friday, May 14th, 2010 at 09:50 and is filed under Tutorials. You can follow any responses to this entry through the RSS 2.0 feed. You can leave a response, or trackback from your own site. I am a freelance photographer in India. I enjoy Photography and Photoshop to a great extent. 'Be creatvie' is my motto.